With long-reaching roots in Ohio, I guess it stands to reason that I have a lot of farmers in my family tree. They weren’t famous, and I seriously doubt they were trendsetters. But with their lives so intrinsically tied to the land, I love what these ancestors can tell me about history. 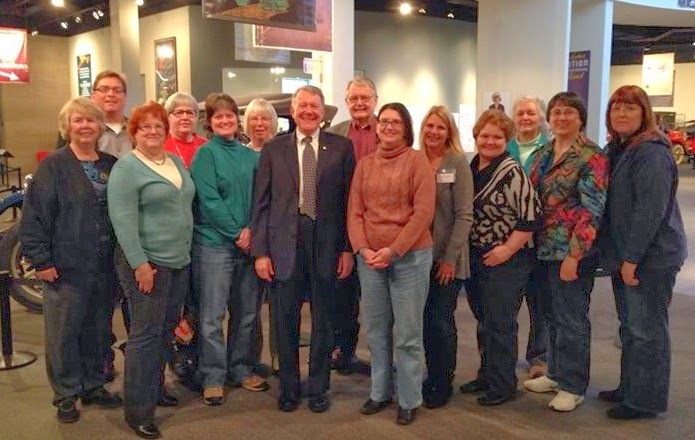 Evidence of the Clark family’s origins in Ohio dates to over two hundred years ago, when… George Clark, Sr., applied for 160 acres of public land at the Zanesville Land Office on 11 March 1811. Identified as a resident of Licking County, George put $80 down on the northwest quarter of Section 22, Township 1, Range 11. The land cost two dollars an acre. George made all his payments and was issued a patent for the Licking County tract on 19 August 1812. This section, located between Hebron and Zanesville, would eventually front the new National Road, although the road’s route through Ohio had not yet been conceived. George Clark was born 29 April 1771, according to a family Bible record. He married Juda or Judy Divers in Sussex County, New Jersey, on 14 June 1798. She was born in 1775. The couple had five children: John Clark, born 5 July 1800; William Clark, born 21 June 1804; George Clark, born 28 November 1806; Anna Clark, born 15 January 1809; and Margaret Clark, born 4 February 1811. Although no known record of their journey exists, the Clark family likely followed an established trail from New Jersey to Ohio. The Braddock Road was a popular, though difficult, wagon route for early settlers bound for the Ohio country. Originating in Cumberland, Maryland, the Braddock Road cut a rugged path through the Alleghenies to Pittsburgh, Pennsylvania. Later census enumerators indicated that George Clark Jr. was born in Pennsylvania, and his parents were born in New Jersey. This suggests the family had begun their westward migration by 1806. Zanesville, site of the land office that George visited, was the capital of Ohio from 1809-1812. Columbus had not yet been founded when he arrived in the state with his young family. With the War of 1812 just on the horizon, and tales of Indian raids and unrest to the north, their future was far from secure. The work of building a homestead and carving a farm out of nearly unbroken wilderness required stamina and determination. 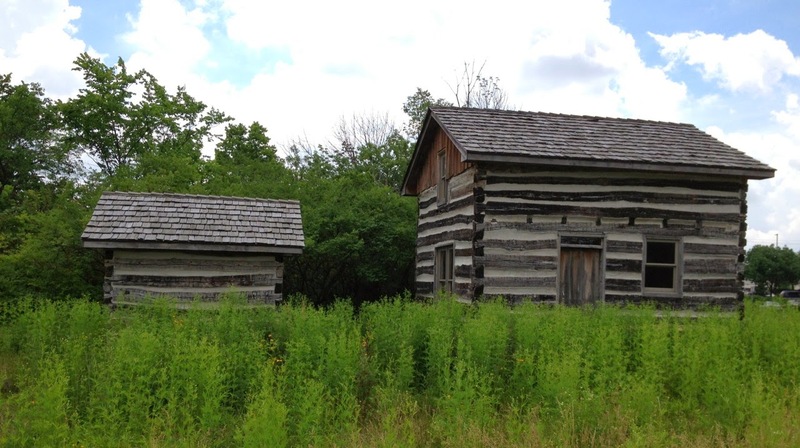 Another early resident of Licking County, Henry B. Curtis, recalled arriving in Newark with his parents in 1809, then a small hamlet of perhaps 80 families living in log cabins. He described how, using only a few simple tools, the pioneer set about building a cabin: “Having selected his spot, the tall, straight young trees of the forest are to be felled, measured, cut, and hauled to the place… Whiskey… is laid in, and due notice given to such neighbors as can be reached, of the day appointed for the ‘raising.’” Once the shell of the cabin was erected, the settler and his family had to complete the puncheon floor, “…the big log fire place; the beaten clay hearth; the stick and clay chimney; the ‘clinking’ and ‘daubing;’ the paper windows, and the door with wooden latch and hinges.” After that, there remained the considerable work of clearing the primeval forest and underbrush for farming. At some point after Margaret’s birth in 1811, Judy (Divers) Clark died. On 27 October 1814 in Licking County, George Clark married for a second time, to Mary Sutton. She was born 18 April 1780. George and Mary had three children: Elizabeth Clark, born 23 October 1816; Suzanna Clark, born 1 March 1819; and Samuel Clark, born 23 June 1822. The Bible record also notes the births of Albert Clark on 18 April 1834 and James Clark on 19 September 1839, written on the same page but in a different hand. These last two births occurred beyond Mary’s expected childbearing years, at ages 54 and 59, and were likely grandchildren. Their names correspond to the sons of Samuel Clark, living next to George and Mary in 1850. The growing family was reflected in the 1820, 1830, and 1840 U.S. census enumerations of George Clark’s household in Franklin Township, Licking County. The land proved well suited to farming, and the Clark farm prospered. The completion of the Ohio & Erie Canal in 1834 opened new markets for farm produce, and demand and prices for wheat, corn, and other commodities increased. By 1850, when he was 80 years old, George’s property was valued at $3000. With 100 acres under cultivation, he produced a variety of crops, including wheat, Indian corn, oats, wool, potatoes, butter, and hay, and kept an array of livestock. I think George Clark would be amazed if he could see the land he called home today. In the article, I cover three more generations of George’s descendants, and the many changes they witnessed. If you get the chance to read it, I'd love to hear what you think. 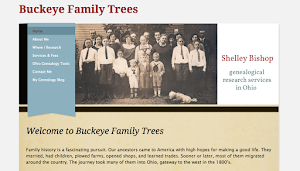 Shelley K. Bishop, “Turning Forests into Farms: The George Clark Family of Licking and Delaware Counties, Ohio,” Ohio Genealogical Society Quarterly, Vol. 53, No. 4 (Winter 2013), p. 360-367. 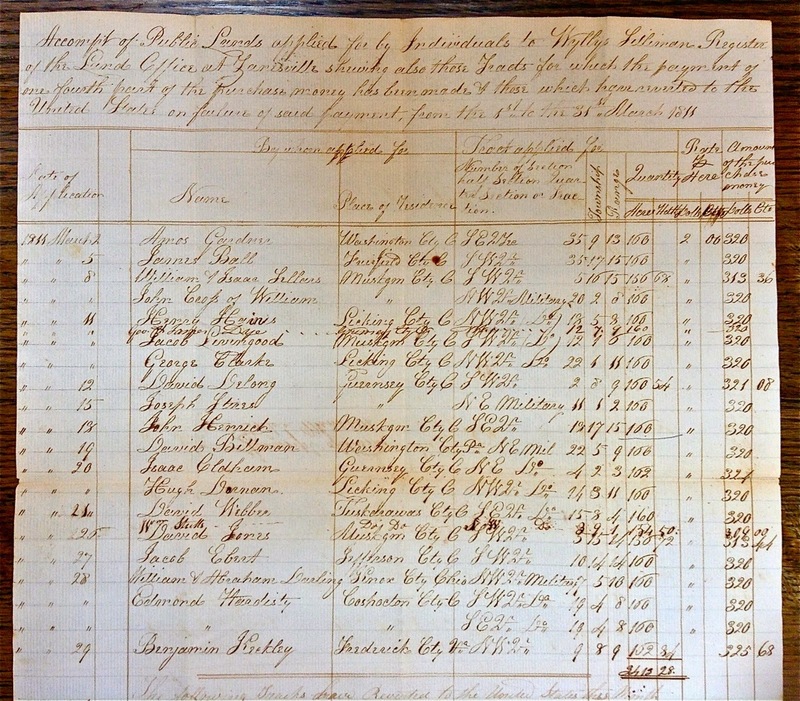 Ohio Auditor of State, Register’s Monthly Report of Applications to Purchase Land, Zanesville Land Office, 1805-1815; State Archives Series 1997, item BV4452, loose papers, “Account of Lands Entered March 1811” and “Monies Entered March 1811 Zanesville,” entries for George Clark; Ohio Historical Society Archives, Columbus. Bureau of Land Management, “Land Patent Search,” digital images, General Land Office Records (www.glorecords.blm.gov : accessed 14 Feb 2013), record for George Clark (Licking County, Ohio), issued 19 August 1812. “Public Member Trees,” database and images, Ancestry (www.ancestry.com: accessed 21 Jan 2013), uploaded image of George Clark Bible “Births” Family Record page, submitted 4 Mar 2012 to “Parmeter-Brooks-Rambo-Eden Family Tree” by Lorilee Anderson. 1880 U.S. census, Trenton Township, Delaware County, Ohio, population schedule, E.D. 115, p. 460A, dwelling 50, family 50, George Clark; digital image, Ancestry (www.ancestry.com: accessed 30 Sep 2011), citing NARA microfilm T9, roll 1012. Also, 1860 U.S. Census, Trenton Township, Delaware County, Ohio, populations schedule, p. 43 (printed), p. 88 (stamped), dwelling 310, family 312, George Clark; digital image, Ancestry (www.ancestry.com: accessed 30 Sep 2011), citing NARA microfilm M653, roll 957. Henry B. Curtis, “Pioneer Days in Central Ohio,” Ohio Archeological and Historical Publications, vol. 1:16, p. 240-251; reprinted in booklet form by the Ohio Historical Society. 1850 U.S. Census, Franklin Township, Licking County, Ohio, p. 465, dwelling 143, family 144, Samuel Clark; digital image, Ancestry (www.ancestry.com: accessed 28 Jan 2013), citing NARA microfilm M432, roll 703. 1820 U.S. census, Franklin Township, Licking County, Ohio, p. 23B, entry for George Clark; digital image, Ancestry (www.ancestry.com: accessed 28 Jan 2013), citing NARA microfilm M33. Also: 1830 U.S. census, Franklin Township, Licking County, Ohio, p. 347, entry for George Clark; digital image, Ancestry (www.ancestry.com: accessed 28 Jan 2013), citing NARA microfilm M19, roll 134. And: 1840 U.S. Census, Franklin Township, Licking County, Ohio, p. 218, entry for George Clark; digital image, Ancestry (www.ancestry.com: accessed 28 Jan 2013), citing NARA microfilm M704. 1850 U.S. Census, Franklin Township, Licking County, Ohio, p. 464, dwelling 142, family 143, George Clark. 1850 U.S. Agricultural Schedule, Franklin Township, Licking County, Ohio, p. 603, line 9, George Clark; digital image, Ancestry (www.ancestry.com: accessed 23 Feb 2013); citing original records, NARA microfilm T1159, roll 6. Congratulations on the publication of your article, Shelley! When I saw your post today about Clarks in Ohio, I had to take a look--wondering, all the time, whether you and my husband would turn out to share roots, courtesy of your fifth great grandfather. Apparently not, as it turns out, though we came close. His Clark ancestors came from Maryland, and settled just south of Licking County in Perry County areas. Goes to show how common a surname Clark can be--even among sparsely populated settlements in early 1800s Ohio! Interesting and enticing lead in to your published article. Must get my hands on it. Congrats! I enjoyed the story about George Clark. My second great grandfather was Moses Clark. My Great Grandmother was Addie Jane Clark.